Saudi Arabia's Global Arms Shopping Spree : Parallels The Saudis accounted for a quarter of all sales by Germany. It's part of an emerging pattern of weapons purchases by Saudi Arabia and its neighbor United Arab Emirates. Both countries are major customers of the U.S., the world's No. 1 arms seller. A Leopard 2 A6 tank is in operation during the German army exercise in Bergen, Germany, on Oct. 2. 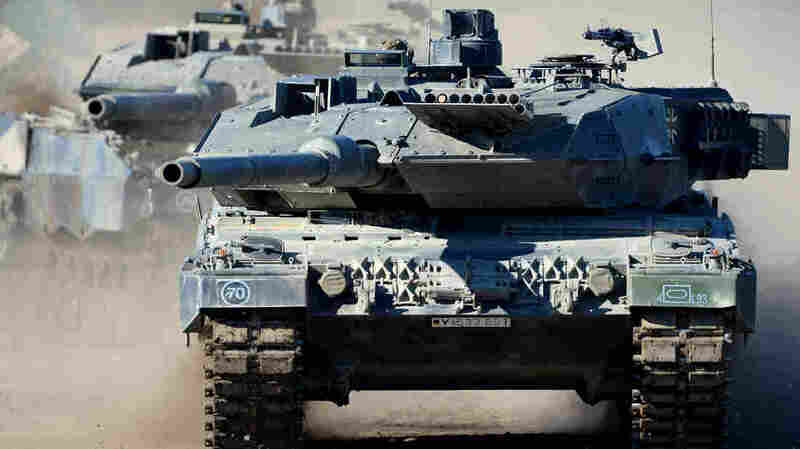 Germany said it would sell 270 of the tanks to Saudi Arabia last year. According to official figures, the Saudis were the top buyers of arms from Germany. Saudi Arabia has emerged as the biggest foreign customer for German arms, buying nearly a quarter of Germany's total weapons sales. It's part of an emerging pattern of weapons purchases by Saudi Arabia and its neighbor, the United Arab Emirates. 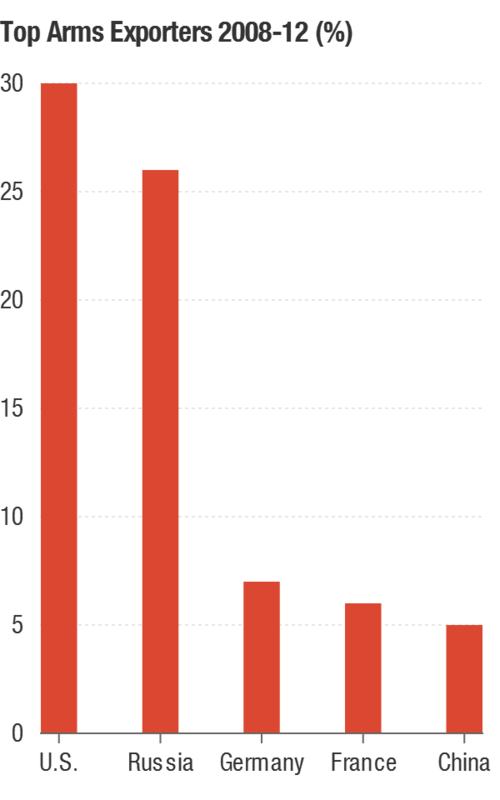 Saudi Arabia was the world's 10th-largest weapons importer in 2008-2012 (the Emirates was No. 9). And Saudi Arabia is expected to be among the top five for 2013-17 "due to major outstanding orders, such as for 48 Typhoon combat aircraft from the UK and 152 F-15SA combat aircraft from the USA." That's according to Stockholm International Peace Research Institute, which tracks such sales. Last month, the U.S. Defense Department said it would sell the Saudis and the Emiratis $10.8 billion in advanced weaponry, including Boeing's Expanded-Response Standoff Land Attack Missile and Raytheon Joint Standoff Weapon. "The Saudi regime has pressed the U.S. to maintain tough economic sanctions on Iran, both to discourage it from developing a nuclear arsenal and to limit Iran's capacity to help its embattled ally, Syrian President Bashar al-Assad, according to two U.S. officials who spoke on condition of anonymity about diplomatic relations." Those stories prompted us to examine the world's top arms buyers — and their biggest suppliers. SIPRI maintains the data, but its figures are a percentage of total sales — not the dollar amount. This is because not every country provides details of its weapons sales. Also, SIPRI's figures cover a five-year period. The accompanying graphs show the data for the period 2008-2012. SIPRI estimates that the total value of arms sales in 2011 was at least $43 billion. But that number is a low estimate, as the U.S. Congressional Research Service says that in 2011, "the value of all arms deliveries to developing nations was $28 billion." That's just for developing nations. And that's sales from the U.S. alone. The U.S. dominated sales, followed by Russia. Germany, France and China accounted for much of the rest of the sales. The top five arms buyers were all Asian nations: India, China, Pakistan, South Korea and Singapore. 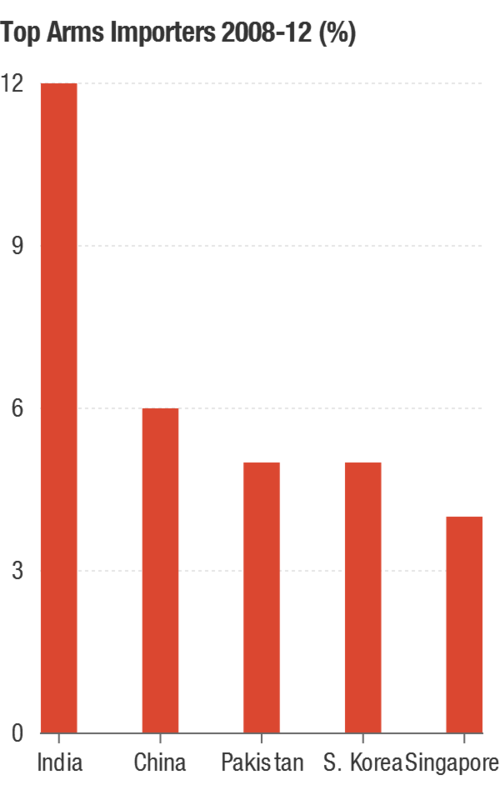 Together, they accounted for nearly a third of all arms purchases during the period. But taken together, the Asia-Pacific, including the Middle East, accounted for half of all global arms purchases. Russia was the top seller to India and China. While China sold Pakistan half the arms Islamabad procured in that time. The U.S. dominated sales to South Korea and Singapore.